Rosamund Pike stars Marie Colvin in A Private War. January 22, 2019, Stony Brook, NY– Staller Center for the Arts’ Spring Movie Series will hold a special screening of A Private War on Friday, February 22, 2019 at 7:00 pm. A Private War tells the story of the journalist and war correspondent, Marie Colvin, who was killed in 2012 while reporting from Syria. The screening is being held in cooperation with Stony Brook University’s School of Journalism and the Long Island Press Club. It will be followed by a question and answer period with the film’s director Matthew Heineman, Academy Award-nominated and Emmy Award-winner (documentaries Cartel Land and City of Ghosts) and moderated by Howard Schneider, Founding Dean of the School of Journalism. 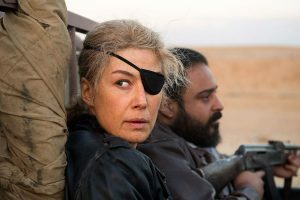 A Private War stars Rosamund Pike as the journalist, Marie Colvin, with Jamie Dornan and Stanley Tucci in supporting roles. Peter Debruge of Variety observes that Pike delivers “a performance of raw, unrelenting conviction in which she comes across as dedicated to capturing Colvin for audiences as Colvin was to portraying the war for readers back home.” Pike was nominated for a Golden Globe award for her performance. Marie Colvin was a native Long Islander with a fearless and rebellious spirit who reported from war-town countries, giving a voice to the voiceless. Stony Brook University’s School of Journalism established the Marie Colvin Center for International Reporting in her memory with strong support from the Colvin family and a Board of Advisors, which includes well known journalists from around the world. A Private War is screening at Staller Center on the seventh anniversary of Marie’s death. Donation cards to support the Marie Colvin Center for International Reporting will be available in the lobby of the Staller Center. Staller Center’s Spring Movie Series offers a movie pass for $30 for ten films, screening on five Fridays in February through March at Stony Brook University, General admission tickets to A Private War are $10 for adults, $7 for students and seniors, and $5 for Stony Brook University students. To order go to stallercenter.com/movies or call the box office at (631) 632-ARTS . More about Marie Colvin may be found here.